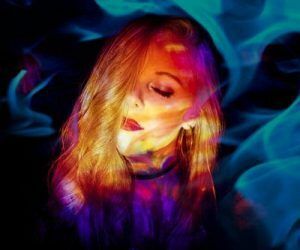 Rebekah Fitch’s debut EP ‘Broken Mind’ is a breath of fresh air, tackling real-world issues in a time of pointless pop and lazy lyricism. The Northern Irish, dark pop wonder, is creating a sound that is upbeat yet carries a significant message which challenges the listener by posing some important questions. A Love So Crazy showcases Fitch’s impressive voice and striking range. Set against the catchy, electro melody it creates an alternative pop track that is instantly memorable and a great introduction to the EP. Fake Smiles takes on a more original subject matter, with Fitch’s lyrics tackling the social media epidemic taking place at the moment, with emphasis on the fickleness and falseness that surrounds it. With lyrics such as “Locked up, weighed down by a perfect façade,” Fitch is showcasing herself as a very socially conscious songwriter, but one that incorporates a good melodic arrangement, that helps her lyrics pack a punch. Not myself sticks to this style; while the lyrics are clearly drawn from a dark place of mental illness, the synth-pop arrangement is undeniably catchy. “I am not myself, can’t understand what’s happening to me; Only sleep can pull me out, I live in dreams and memories” sings Fitch, as she once again conveys that she is not afraid to stray away from the norms of pop writing. Her often experimental sounds are the result of a degree in music, specialising in electronic composition. Overall, this is a great debut EP. Fitch succeeds in finding a sound and style that’s both fresh and compelling, while admirably tackling some socially relevant and often taboo subjects in her lyrics.